AS Creative Services is a full-service Internet marketing firm, serving clients Nationwide. We leverage an integrated team of consultants, designers, writers, programmers, and marketing professionals to produce unparalleled results. AS Creative identifies the best way to advance your brand. We create visually and conceptually striking material that engages and expands your audience. AS Creatives’ website and print design work can be tailored to your existing brand or we can redefine your image altogether. Our team includes experts in every facet of design and development. From start to finish – from stunning website design through mobile app development – AS Creative Services easily navigates even your most complex marketing initiatives providing solutions at an affordable cost. Description: WordPress was born out of a desire for an elegant, well-architectured personalpublishing system built on PHP and MySQL and licensed under the GPLv2 (or later). It is the official successor of b2/cafelog. WordPress is fresh software, but its roots and development go back to 2001. It is a mature and stable product. We hope by focusing on user experience and web standards we can create a tool different from anything else out there. The Default Theme: WordPress requires a theme to be enabled to render content visible on the frontend. The default theme whichships with core WordPress (currently “Twenty Fifteen”) has been vigorously reviewed and tested for security reasons by both the team of theme developers plus the core development team. The default theme can serve as a starting point for custom theme development, and site developers can create a child theme which includes some customization but falls back on the default theme for most functionality and security. The default theme can be easily removed by an administrator if not needed. WordPress.org Theme and Plugin Repositories: There are approximately 50,000+ plugins and 4,500+ themes listed on the WordPress.org site. These themes and plugins are submitted for inclusion and are manually reviewed by volunteers before making them available on the repository. WordPress used to be described as more of a blogging platform in the past. The misconception is that it is not a viable Enterprise level product. However, over the years it has transformed into the most flexible and robust platform on the market. Usage of content management systems for websites: This diagram shows the percentages of websites using various content management systems. See technologies overview for explanations on the methodologies used in the surveys. Our reports are updated daily. How to read the diagram: 48.1% of the websites use none of the content management systems that we monitor. 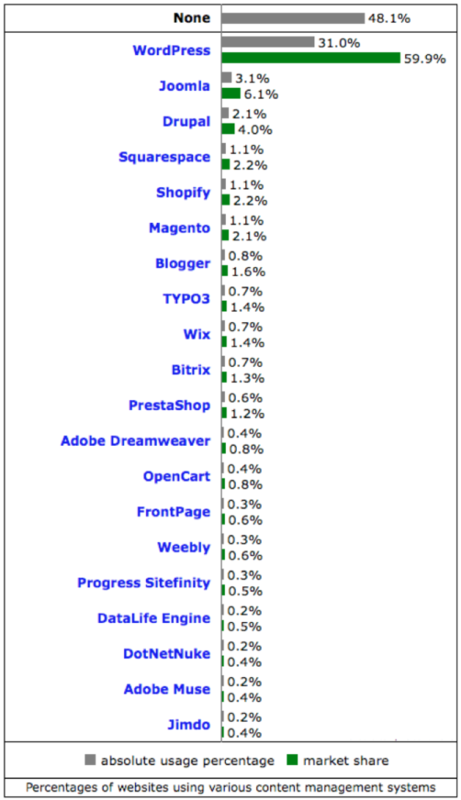 WordPress is used by 31.0% of all the websites, that is a content management system market share of 59.9%.